The Ojai Certified Farmer's Market located at 300 East Matilija Street, Ojai. Beylik Family Farms invites you to try the Ojai Certified Farmer's Market. 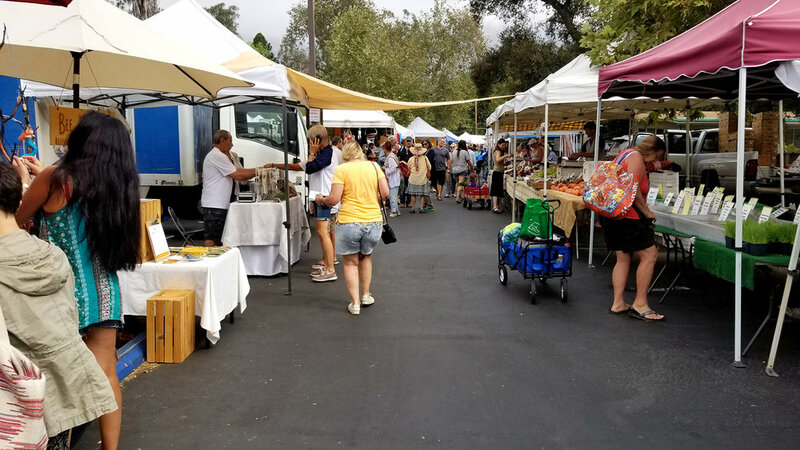 The Ojai Certified Farmer's Market is open Sundays from 9AM to 1PM. The market is located at 300 East Matilija Street, Ojai CA 93023, right behind The Arcade Plaza. The market features locally grown fresh fruits & vegetables harvested daily, Jams, Honey, Bees Wax Candles, Breads, Gourmet Desserts, Fresh Locally Caught Seafood, Natural Meats, Olive and Walnut Oil, Free Range Eggs and Organic Chicken, Nuts & Dried Fruit, Prepared Food, Raw Chocolate, Fresh Cut Flowers, Plants, Orchids & Handmade Soaps. Sonia hosting our booth at the Ojai Farmer's Market. Sonia hosts our booth at the Ojai Market. She likes to visit with her regular customers and meet new people who are visiting Ojai. Sonia has been hosting booths at Farmers Markets for over 10 years. Sonia is a Fillmore native and graduated from Fillmore High. She attended CSUN and has a BA in Sociology with an emphasis in Criminal Justice. Sonia has always enjoyed helping people and is interested in a career in law enforcement. If you like to win free vegetables and other prizes, follow Beylik Family Farms on Social Media, or sign-up for our email list, and you're automatically entered to win our monthly drawing. If you don't live near Ojai, please visit us at any of the Certified Farmer's Markets we regularly attend listed below. Newer PostSummer Squash First Planting!